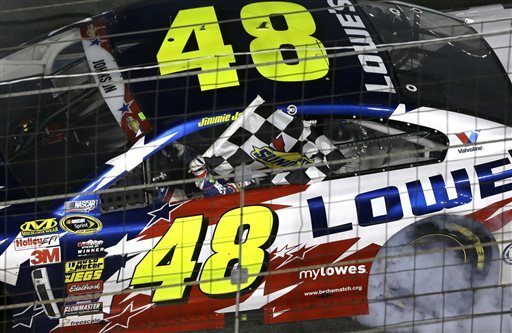 It took Jimmie Johnson, a six-time and defending Sprint Cup champion, nine years to finally get a win again at the Charlotte Motor Speedway in the Coca-Cola 600 race, making it a fourth for him on the track and moving him up to 6th in the Sprint Cup standings, and more importantly getting his first win of the season. Having a fast car and a history of winning on the track doesn’t make you automatically a favorite. But being in the pole position and having a lot to prove after 11 races of finishing usually outside the top 10 seemed to be quite the driving force for the 38 year old driving for Hendricks Motorsports made a huge difference, which now means he is almost 100% in the chase, as the talk of him not adjusting to the new rule package will simmer down. 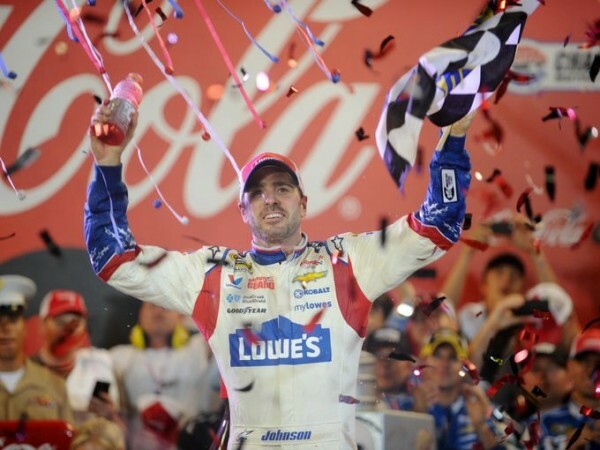 Johnson led the race for 164 laps, more than anyone else, and finished 1.27 seconds ahead of Kevin Harvick, one of only two races to win twice this season so far. However, it didn’t come with a little bit of luck helping him out, as Harvick having the fastest car for a big chunk of the night (100 laps) didn’t help him, with a loose wheel forced him to play catch up in the end, feeling like he needed a slightly longer race to come out as the winner. A cleaner pit stop would have probably been better, although Harvick seemed to be catching up with Johnson, and a few more miles would have actually made a big difference. Harvick has a famous saying about Johnson regarding his luck (golden horseshoe where the sun doesn’t shine) but didn’t use it this time. When it happens more than once, Johnson, obviously, is a lot more good than lucky to finish ahead of him. I promise you, all the hype, all the concern and worry, that was elsewhere. It wasn’t in my head. Yeah, they know we’re awake. The No. 4 car has had that momentum this year. They’ve been able to go out and execute and show a lot of speed and win. Hopefully, this 48 is heading that way and we can get those other people thinking about us. Danica Patrick started in fourth and managed to move ahead to second, but lost the handling on her car and was held back even more with wreck, leading her to a disappointing 39th place finish, one ahead of Kurt Busch. Jeff Gordon actually had the lead with 17 laps to go on the final restart, but he lost the top spot to Matt Kenseth who got blown by Johnson quickly, while Gordon fell back to 7th, dealing with back problems. Dale Earnhardt Jr. was roaring with his superhero paint scheme and actually led the race for 13 laps, but according to team owner Rick Hendrick had late vibrations and problems with his breaks, which led to him falling behind and finishing 19th. Johnson didn’t make the most interesting of stories or attractions on the day, but he simply drove better than everyone else.